The scenes show what interesting characters the characters are – but it also shows what an interesting character Quentin is. — Christoph Waltz, 2013 interview for DJANGO UNCHAINED. Writer-director Woody Allen‘s early work certainly has two main gears: dark and absurd. The absurd gear drives comedies like SLEEPER, LOVE AND DEATH, ZELIG, et al, while his dark gear (which – let’s face it – also drives his comedies) showcases not just society’s tribulations, but his own dark interior. INTERIORS follows the fortunes of three sisters whose mother is tipping into unbalanced due to her sudden late-life divorce. It is uncomfortable, visceral, intelligent and disturbing. The luminous Diane Keaton is Renata, clinical Mary Beth Hurt is Joey and the youngest is Kristin Griffith as Flyn, playing a glamorous movie star, yet for me, Keaton outshines her for beauty, brains and cute buck teeth. Richard Jordan and a young Sam Waterston play two of the husbands. Dark vulture mother is Geraldine Page as Eve, bravely coming across as that irritating, pokey mother-in-law who turns up unannounced and begins critiquing your husband’s choice of furniture. Eve is an interior decorator trying to get back into the swing after her husband (and father of her three daughters), Arthur (E.G. Marshal), divorces her. We can see she is fooling herself into believing she’s doing fine, while through the discussions of her daughters we know she’s slipping into madness. Meanwhile, Arthur has just returned from gallivanting overseas with his new young wife (well, young-er) Pearl (played with ignorant bliss by Maureen Stapleton). At a family dinner thrown by the three daughters, they look upon her with disdain as a vulgarian, as she misses the points of philosophical discussions that the girls and their husbands easily lapse into. And here is where we find the beauty in Woody Allen movies: No one ever has to explain or qualify why they are educated! Let me clarify: in most modern movies, if a character says something remotely intelligent or “scientific” they immediately qualify it with “I read it in National Geographic” or “I saw it on a science program once.” In Allen’s movies, we take it for granted these people are educated due to their professions and their dialogue, and – even better – he takes it for granted we are educated and never talks down to us through his characters, or insults us with qualifications. These characters are artists, writers, critics; they may even be considered elitist, but I ask you, in a First World society doing their damnedest best to remain UN-educated and reveling in their ignorance, how can an educated person not feel elitist? The best insight that Allen captures in INTERIORS is the Artist’s dissatisfaction with finished works. No matter how good it is intrinsically, or how well it is received publicly, why is one never satisfied with one’s work once it is created? All the characters here, though relatively successful, seem unfulfilled (except for Arthur, who is gettin’ it on with that raving dunce), and Allen captures that ineffable feeling of post-creation that every Artist experiences, for all their works. When we see these scenes play out – with Joey and Renata complaining to their husbands how they feel like they’ve missed something in the finalization of their work, how Renata’s husband feels self-loathing after publishing his book, etc. we realize that once a creation is stamped as “completed” and released to the public, all the further ideas that might have gone into that creation to improve it must necessarily be stultified, or the Artist would go insane with regret. You never feel like stamping anything “final” yet if you didn’t, you would never have any product. Not only is this an insight into the mind of the Artist, we can feel touch taste these words coming directly from the mind of Allen. We start to question if he felt that post-creation anxiety with the production of this very film. I’m sure he did – but not for the reasons you may think. INTERIORS is sparse, with no soundtrack, and there are no cutesy camera tricks. (In LOVE AND DEATH, Allen satirized Bergman, here he pays stylistic homage to Bergman.) That’s not what Allen would be anxious about. His film tells a story – of a suicidal mother and her daughters’ efforts to palliate her loneliness while also reconciling with their father’s new lifestyle – and within that story, a wild concept of artistic dissatisfaction; a film so insightful that it doesn’t need cutesy camera tricks. Allen would be feeling anxiety on whether he got that MESSAGE across lucidly. He can never “add” to it now that the film is complete. Yes, Woody, I think we got it, you goddam genius. 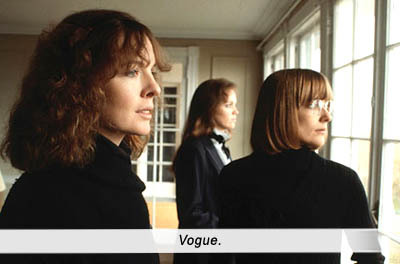 Starring: Diane Keaton, Geraldine Page, Kristin Griffith, Mary Beth Hurt, Richard Jordan, E.G. Marshall, Maureen Stapleton, Sam Waterston. Underrated, overlooked Woody movie (except by the great Poffy). Unfortunately sandwiched between comedy classics Annie Hall and Manhattan in the Woody timeline and snubbed accordingly, it proves that even during the Renaissance of American filmmaking, audiences were shallow and petulantly demanding. No wonder that Allen portrayed “fans” constantly bombarding him in public with requests for his “early, funny” movies (in Stardust Memories, 1980) – and no wonder fans got offended: the truth hurts.